2013 Road Glide Custom CVO in Roman Gold/Burnt Emerald, Le Pera Maverick, Vance & Hines Power Duals, SERT, MadStad 13", Kury ISO grips & Scythe mirrors. I do not understand how this works. Can't anyone with a knife just cut off the D rings in about 2 seconds? I am looking around for a good way to lock a helmet to a bike and the cable seems to be the most logical. Last edited by beerhunter; 03-21-2019 at 09:50 AM. I think if you cut the D rings off the helmet is useless at that point as well. I've not used since I bought it over a year ago but I have one of those lockable carabiner that HD sells. I actually like it and when I'm ready to use I'm confident it will do the job. Road Glide L.E.D. Accent KIT Plug & Play - No Cutting, No Splicing. Touring Specific - PM me for details. "Just put that hammer down and give it hell" -Jerry Reed. 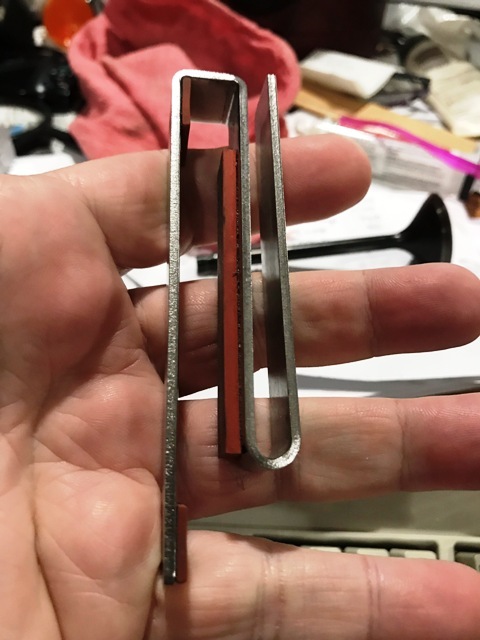 I have a little steel bracket. just drop it over the edge of the open saddle bag, hang the d-ring onto the open end, and close the saddle bag. The lid overlaps the open end and its locked into place. Has some rubber pads glued to it for protecting the paint. Its quick to use and I just toss it into the glovebox when its not needed. I bought 2 of these. They are cables with round balls on the end. The red ball has a quick release and u slide it through d ring and put it back on. Then u place the ball in the saddle bag and lock it. Pretty good. It's long enough to lock the cable in the bag and sit the helmet ontop if it. Last edited by Gotchu99; 03-21-2019 at 01:57 PM. [QUOTE=FlyByWire;611841]I've resorted to keeping the helmet on the floorboard, locked to the crash bar through the chin bar of the helmet, with a gun cable lock. Didn't want a helmet lock hanging from the bike anywhere. I do the same as FlyByWire and use a gun cable lock. Keep the lock in the bag and pull it out when needed. Didn't want to hang a helmet lock on bike don't like the look.